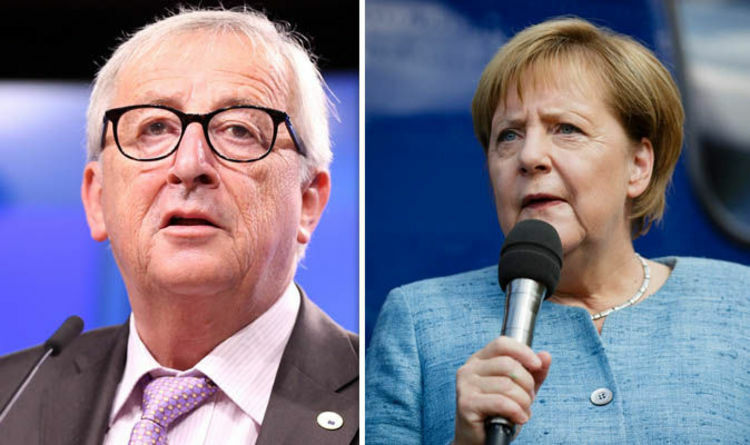 The German Chancellor should replace current European Commission chief Jean-Claude Juncker, said Denis MacShane, the former UK Minister of Europe. In an op-ed published on the Independent, Mr MacShane argues that, while Europe could be “overloaded” by the appointment of another German “middle-rank” politician in Brussels, a woman of the political stature of Mrs Merkel could be beneficial. He said: “Might Angela Merkel herself seek to be the first woman president of the commission? According to Mr MacShane, who was Labour MP for Rotherham between 1994 and 2012, Mrs Merkel would be the best choice for the job. The former MP believes Mrs Merkel is not only qualified because of her political sharpness, but also for the desire of reforming the EU she shares with French President Emmanuel Macron. The former MP also believes Mrs Merkel is already on the right mindset to lead the EU, despite still being the leader of Germany. He added: “Merkel always says her last great challenge is to restore confidence in and purpose to the European Union. Mr MacShane’s support for Mrs Merkel comes after rumours the German Chancellor is plotting to replace Mr Juncker with a top-role politician from Berlin emerged. Manfred Weber, leader of the conservative People’s Party in the European Parliament, has been touted as a potential candidate for a top role in Brussels. Another name on the cards is Peter Altmaier, a long-time ally of Mrs Merkel and current German minister for economic affairs and energy. Mr Juncker’s five-year mandate is set to end next year.